Sweet and deliciously creamy, Carnation® Condensed Milk is made from all natural ingredients. Made with just two ingredients, fresh whole milk and natural sugar, Carnation® Condensed Milk makes it quick and easy to create sweet treats from creamy cheesecakes to Millionaires' Shortbread. 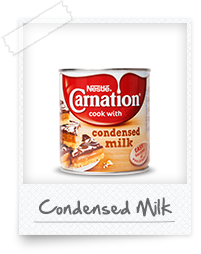 Carnation® Condensed Milk is available in 397g tins and 170g and 450g squeezy bottles. INGREDIENTS: Whole Milk, Sugar. Minimum 8% Milk Fat, 20% Milk Solids Not Fat. Condensed Milk is rated 5.0 out of 5 by 189. Rated 5 out of 5 by Nordiclaura from Perfect for fudge Perfect for your ultimate fudge recipe. As it was easter made it in to hot cross bun flavour. Rated 5 out of 5 by Cakesamust from Excellent product I have now purchased several cans to make the caramel chocolate cake which has been really appreciated by my neighbours and friends. Why so many cans? because I always want to plan ahead and have the vital ingredients in my cupboard when I have the urge and time to make the cake. Rated 5 out of 5 by Chriserlew from Evaporated milk I bought a tin two weeks ago because I like to add it to my homemade rice puddings, when this milk is added to the rice pudding it gives it a rice full bodied tast with an added luxury, my mother always used Carnation for her cooking and especially in puddings and custards. Rated 5 out of 5 by Teenagenan from Fabulous taste and great pictures on tin. I have loved this since I was a child and it just seems to keep getting better. I now have my grandchildren as addicted as I am. Condensed milk is fabulous for deserts and fudge and even savoury dishes. I wouldn't be without a tin in my cupboard. Rated 5 out of 5 by cookiemonster66 from Perfect Fudge You cannot make the perfect fudge without Carnation condensed milk. A recipe my nan taught me has lasted throughout the generations. Whenever I see Carnation it reminds me of her and the hours we spent baking, especially tasty fudge. Rated 5 out of 5 by Hazynana24 from So versatile a store cupboard essential. 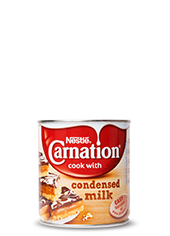 Carnation condensed milk is my number 1 ingredient for so many of my cakes & puddings & the best part is that even if you don't do home baking just spread on a slice of hot buttered toast or a crumpet it literally makes my day! Rated 5 out of 5 by Ridders84 from Fantastic product. I used carnation condensed milk as per the recipe for millionaires shortcake to make caramel and the finished product was perfect. So much so that my son said it was his favourite dessert of all the things I’ve made. Rated 5 out of 5 by Jennywren from Never lets you down! I made some millionaires shortbread for the first time and they were fabulous, all thanks to Carnation condensed milk and the recipe I found on the Nestle site. I shall be trying a few more recipes now! Rated 5 out of 5 by JackieBear from Lovely I could eat the tin of this and more. I remember licking the spoon when my mum made tablet. Being Scottish, tablet was a regular feature in our house. Thanks for trip down memory lane. Rated 5 out of 5 by Wenz61 from Versatile little tin! I always have a tin in my cupboard as it makes delicious fudge for Christmas gifts; fantastic for Banoffi Pie for my grandies and makes anything it is used, so creamy. Rated 5 out of 5 by Cornwall guys from Caramel shortbread (millionaires shortbread) I got an old school receipe and made caramel shortbread with the condensed milk it was amazing just like it used to taste it brought back so many old memories. 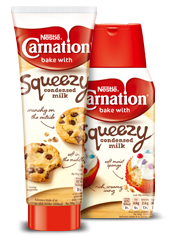 Rated 5 out of 5 by Charly from Amazing Product I have made a lot of bakes in the last couple of years and most of them consist of condense milk and I have tried a few different brands of condense milk in certain recipes but none of them do the same job as this one. This is a must have in my baking cupboard I always like to stock up on a few encase i deiced to make caramel, fudge, millionaire shortbread etc. This product is amazing and works well with a lot of my recipes i have tried with it. Rated 5 out of 5 by grl_watts from Cooking's Best Kept Secret I have tried countless Fudge recipes over the years and have never quite cracked my own special blend. Until I introduced Carnation Condensed Milk! I first used Carnation at Christmas and it created the creamiest most delicious fudge I have ever tasted! I handed it out as gifts to family and friends, all of who loved it so much that they've requested more for Easter this year! Rated 5 out of 5 by Olivia from Fantastic product - makes the best key lime pie! 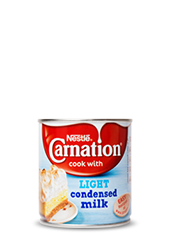 I always use carnation condensed milk because it’s the best tasting one I have come across, and usually not any more expensive than supermarket own brands. I love the easy opening can that doesn’t require a can opener and it can be used in so many different recipes. Well worth cheating and buying a can instead of attempting to make your own. Rated 5 out of 5 by vickielou112 from A little spoonful of Nom! I have bought this product for years - can't remember a time it wasn't in the cupboard. It makes the most delicious desserts - especially my Mom's Lemon Cream Pie it is a special occasion staple - sweet, creamy and decadent! 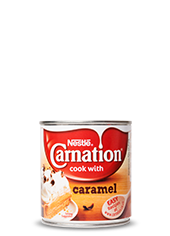 Carnation Condensed Milk is the only condensed milk we use as others just don't taste the same! Rated 5 out of 5 by Traceyloveschampayne from Great product I bought this a few weeks ago to make a banofee pie, I used the old fashioned method of boiling the tin in water for a few hours as this way was told to me by my mum. when I felt it was ready the condensed milk had turned into a lovely caramel mix for my banofee pie! my kids loved it can highly recommend it! Rated 5 out of 5 by pollyanna56 from really like carnation condensed milk, i use it for my cheesecake recipes, but since my husband is not a fan of the biscuit base, i put my cheesecake mix in a fancy glass, then serve with either a scoop of ice cream, or a chocolate flake, decorated with grated chocolate, or if being very naughty - all of them! Rated 5 out of 5 by Nana570 from So easy Used this for cooking when my children were little and now doing the same with my grandchildren. We have made the heart biscuits with jam for their mummy,they enjoyed licking their fingers! Wish I could include a photo but this Nana isn't good at that. Rated 5 out of 5 by Mrs amberdog from Happy Memories ! 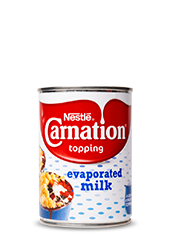 Since the 1950’s Carnation Condensed milk has been a staple part of my life . As a little girl I remember it as a pantry standby in case we couldn’t have fresh milk for any reason - bad weather - milkman didn’t call - spilled fresh milk - you name it ! It was a comforting treat in tea - also on toast which we made in front of the fire on a brass tosting fork . Other things such as baths in a tin bath on front of the fire are just as much a memory - washing off the sweet stickiness of Carnation ! 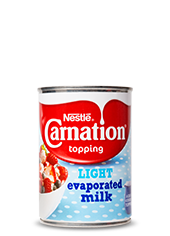 (We had “evap “ on tinned fruit and Mum made a whipped mousse with jelly and evaporated milk which was a great treat for birthdays - but the taste of Carnation Condensed Milk takes me back ! Fast forward to today where I have a state of the art cream maker and use Carnation Condensed Milk both sweetened and unsweetened for our favourite recipes . I was an active child and I’m now an active pensioner and look back with fondness on the familiar packaging and reassuring taste of Carnation . No photos I’m afraid - a Box Brownie camera in those days !